About 37,500 amateur athletes, fun runners and elite sportsmen and women have run the Virgin London Marathon. Kenya's Wilson Kipsang won the men's elite race with a time of 2:04:44 and Mary Keitany, also from Kenya, defended her title with a time of 2:18:37. The men's wheelchair race was won by Britain's David Weir, his sixth victory, and fellow Briton Shelly Woods won the women's event. But a woman runner collapsed and died near the finish of the 26.2-mile race. The event's organisers say the 30-year-old fell as she approached Buckingham Palace. Medical attention was given at the scene, but she was declared dead later in the afternoon. More than 100 people were attempting to break world records during the race. David Stone beat six competitors to break the Guinness World Record for the fastest marathon dressed as a book character. The 42-year-old from Exmouth, in Devon, dressed as Count Dracula and completed the run in two hours 42 minutes, smashing the previous record of three hours and two minutes. He is already a record holder after dressing as Superman last year to break the record for fastest marathon dressed as a superhero. Fauja Singh, believed to be the oldest marathon runner at 101, completed his race in seven hours and 49 minutes. 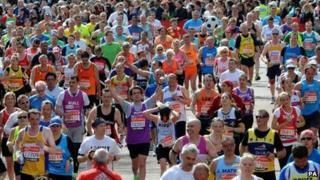 The east Londoner has said this would be his last marathon so he can concentrate on shorter distances and faster times. Sasha Kenney, 34, raised more than £2,000 for the NSPCC when she broke the six-hour mark for the quickest hula hooping runner. She completed it in a time of five hours and five minutes. Other records broken on Sunday included the fastest marathon dressed as a jester in three hours one minute by Alexander Scherz, the fastest marathon dressed as a Roman Soldier in two hours and 57 minutes by David Tomlin and the fastest marathon dressed as a vegetable in two hours and 59 minutes by Edward Lumley. Brother and sister George and Charley Phillips, from Hammersmith, west London, broke the record for the fastest marathon time on stilts coming in at six hours and 50 minutes. Prince Harry, who had earlier met volunteers at the event, was at the finishing line on The Mall to congratulate runners. He told BBC 5 Live: "It's the first time I've been on the finish line to watch it. It's fantastic - a great atmosphere. Everyone's very, very happy." Model Nell McAndrew completed her sixth London Marathon in under three hours for the first time. Also completing the marathon was BBC newsreader Sophie Raworth, 43, who was running for St John Ambulance. In 2011 she crashed into a barrier on the side of the road and blacked out when she reached the 23-mile mark. She completed the marathon in three hours 56 minutes and said: "It was very hard. That was the first time I managed to go all the way round upright because last year I managed to have a bit of a disaster and collapsed. "I found myself running the first 20 miles with a professor of sport so I reckoned that if I was to collapse again he'd probably know the warning signs." Claire Lomas began Sunday's marathon as the first person in the UK to wear a "Rewalk" suit. She suffered spinal injuries in a horse riding accident and is expected to take three weeks to complete the route. Shadow Chancellor Ed Balls ran his first London Marathon and finished in a time of five hours and 31 minutes.